1 String the beans. Slice down the centre or leave whole. 2 Lightly brown the meat, bones and onions in the ghee, using the pot in which the stew is to be cooked. Mix in the beans and fry for a few minutes. Add the salt, pepper and mixed spices, then pour in the tomato paste or soup diluted with water. 3 Bring to the boil, cover and simmer slowly until the meat is very tender. 4 Crush the garlic with a pinch of salt and fry with the coriander in a little ghee until the garlic smells sweet. Stir this mixture into the cooking stew. 5 Serve with Rice Pilaf or Bur’ghul Pilaf. 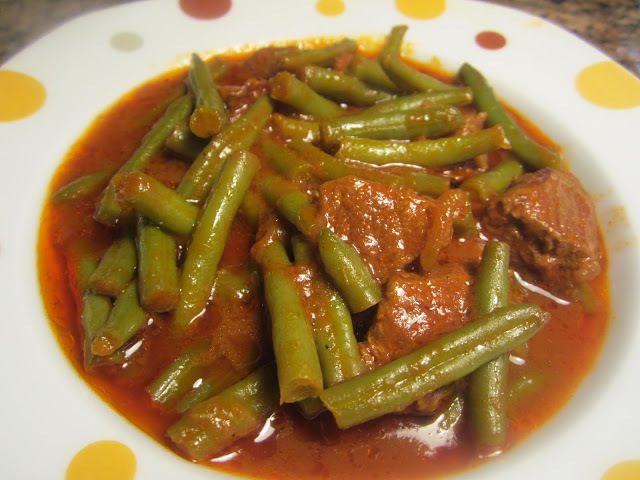 You may substitute peas for beans to make green Pea Stew.